"Somewhere along the line we seem to have confused comfort with happiness." Dean would appreciate the suffering on this tour, or should we say the bittersweet mix of ultra high mileage, fantastic scenery, and great food? This special edition trip is designed for off-season base miles. But before we get labeled a "bike tour" company, this tour is equally about the natural and cultural highlights of Vietnam, the north, central and south that is. Join Iron Chef Champion Neal Fraser and Discovery team rider Tony Cruz for the 4th edition variation of our unprecedented culinary cycling adventure this coming February (for last year's trip, please click here), pedaling through the scenic country roads along Vietnam's northern river valleys along the "Ho Chi Minh" trail (now thankfully the paved Ho Chi Minh Highway), then heading south along the picturesque coast and into the central highlands in and around beautiful Dalat for — as many of our past traveler's have said — the experience of a lifetime. Neal has been eating his own food for so long that his waistline has almost doubled from when he was a champion cyclist, but he's recruited old friend and teammate, Tony Cruz, of the Lance Armstrong's Discovery professional cycling team to help him regain fitness. Judging from past trips, however, Neal might just be putting on the pounds instead. Vietnam features some of the most delicious and innovative cuisine in the world, and Neal and local culinary guides to will reveal the hidden delights of Vietnamese food. There are few culinary adventures on par with Vietnam. This trip will highlight the distinctive cuisines of each region with a mix of activities, including hands-on cooking, kitchen and market visits. Please note that despite having a professional road racer, this tour is suitable for all levels of ability as well as those of higher levels of fitness who will be accompanying daily training rides with Tony Cruz. A Culinary Institute of America graduate who has worked with Thomas Keller at the Checker's Hotel in Los Angeles, David Burke at the Park Avenue Café in New York, and Wolfgang Puck, Neal now serves as Partner and Executive Chef at the trend-setting Grace Restaurant serving his New American cuisine in an atmosphere perfectly designed to complement the ambitious flavors of one of Los Angeles' most revolutionary culinary talents. Neal is also an Iron Chef Champion, defeating Cat Cora in a televised pork cookoff. He was also published in the Wall Street Journal for his mother's day pancakes. 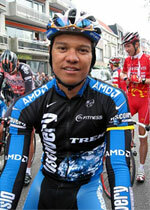 Neal's cycling biography includes Southern California District Road Race Champion and he has also cycled on this Vietnam tour.